And it could reveal secrets about the origins of our universe. Astronomers at the M. Keck Observatory on Maunakea, Hawaii made an incredible discovery earlier this month. 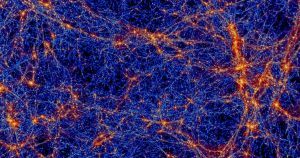 It was a rare relic of the ancient universe: a “fossil cloud” of gas created around the time of the Big Bang. The extraordinary discovery could provide new information about the origins of the universe and its early composition — including why certain stars and galaxies formed from gases and others didn’t. The group was led by Fred Robert and Michael Murphy, both at Swinburne University of Technology in Melbourne. Their results are about to be published in an astronomical journal called Monthly Notices of the Royal Astronomical Society, but they’ve also made them available on the preprint server arXiv. The team used two M. Keck Observatory spectrometers — think of them as extremely sensitive and complex cameras — that have been used to discover exoplanets in the past. The astronomers spotted the fossil cloud because of an extremely bright quasar — a celestial object that emits large amounts of energy — behind it. The spectrometer readings found the cloud to be extremely low in density, leading them to believe it was a “true relic of the Big Bang,” according to Robert, since they remained almost entirely unaffected by exploding star particles that fill the rest of the galaxy. And many more such fossil clouds could be discovered in the future thanks to this particular discovery — the first two fossil clouds were actually found by accident in 2011 — Robert and his team knew to look for this third one.